I hope you've had a good week! It has been a nice week here except for (shudder!) tree surgeons in the neighborhood and thunder on two different occasions. Otherwise, all is good in my world, and I hope in yours too. We have a great question this week that I am really excited about. I hope you will leave comments about dog rescue. (And I always welcome more questions for future columns!). My friend Barbara asked: Hi Abby! We have another question for you. We are interested in how one goes about finding the best Rescue Organization and pet to meet the family's situation. How can you tell if a rescue dog will get along with the existing dog etc. 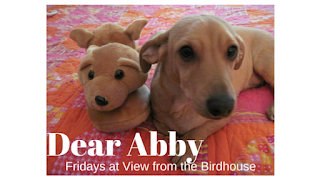 We know you are a rescue, Abby, and maybe you can tell us how it was for you to be adopted. What were some of the challenges? Really looking forward to reading your replies! That is a great question! As a rescued pup, I feel very strongly about adopting dogs and cats who need a home. I had a dramatic rescue story, but thankfully it had a happy ending. I was found as a stray living in a shopping center parking lot. A good samaritan found me and took me to a local rescue group. They were so kind to me, and took me to the vet. The vet said I was young and healthy, and I had immunizations, heartworm tests, and a little surgery we call a spay. I then went to live with a wonderful foster mother while waiting for my forever home. I waited and waited ... and then totally by chance my Momma saw me online. She knew that I belonged with her family. It was tricky because I was far away, and transport had to be arranged. I travelled to my new home in an RV! I was a perfect lady on the trip and considered the travel a big adventure. When I met Momma, we loved each other right away. I came out of the RV with lots of kisses. Above, you'll see a photo of me when I first arrived at my new home! I kissed my new brother (the late, wonderful Barney Fife) as well, and I settled in. I was happy from the start in my new home. I had a couple of nervous potty accidents my first week, but then I worked with Momma on a schedule for frequent walks and all was good! I loved my new brother and we got along great. It was a perfect situation for us all. If you are interested in adopting a rescue dog, you have lots of great options. I always recommend starting with local animal controls and shelters in your area. The dogs (and cats, let's not forget the kitties!) at these shelters are in the most urgent need of rescue because many of the shelters only hold available pets for so long. Many shelters have pets listed online, but I highly recommend that you actually go to the shelter and walk through. You can learn a lot about personality and temperament (and this is all important!) by meeting pups in person. You also will find many more pups at the shelter than what you see online. The online photos for animal controls are taken by nice volunteers, but they are not there taking pictures every day. If you don't find a new fur-friend who is a good match at the shelter and you are looking for a specific breed, I recommend you Google to find a rescue group for your breed. For instance, if you are in Florida and you want to adopt a dachshund, you could type in different searches like: Florida dachshund rescue, Miami dachshund rescue, and so on. This will help you connect with rescue groups who will specialize in one breed. Their pups will be living in foster homes, and the foster parent can give you a lot of information about the doggie, i.e. how she does with other dogs, whether she likes children, housetraining, etc. If you adopt through a rescue group you will fill out an application. They will want to know more about your family, including any pets you have. Most rescues will contact your vet for a reference, and will conduct a home visit. This is all in the interest of finding the best match for the doggie. Maybe you don't have a special breed in mind, but you would like a small dog for an apartment or condo, or a big dog who likes children. Then a good starting place would be Petfinder. You can search at that site by size of dog, location, breed, age. You also will find good "all breed" rescue groups in your area that way. If you have a doggie and want to adopt a new friend, it is ideal if you can let the pups meet before adoption. If that isn't possible, you will want to find out about the new pup's temperament and how he or she does with other dogs. When introducing new dogs, it is ideal to meet in a neutral location (not at home, where your pup may feel a bit territorial). You will want to have another friend or family member there, so you can each have a pup on a leash. Let the dogs sniff each other and then walk together on leashes. This is a nice, low key way to let them get to know each other. Whatever you choose ... rescue is such a happy event, and a rescued dog or cat is a blessing to a family. I hope these thoughts are helpful ... and I would love to hear from you in the comments, below. I've told my husband that I want to eventually foster doggies who are waiting for their fur-ever home. It's going to be awhile for us, though, because our rescued bulldogge (a friend couldn't keep him because of her babies' severe allergies) needs to be the alpha male & hogs all of th attention. Eventually though! This is a great step-by-step instruction for going through rescue. Great job, Abby! Hi Abby! What a cutie you are. I love that you guest-post and offer such great tips for rescuing pets. We've rescued two of our pets from local shelters and one who was in need of a new home. They bring us so much love and joy. Congrats on finding your fur-ever home and 2 paws up for being a spokesdog for pet rescue! Yes, there are so many furbabies looking for their fur-ever home. I love the concept of this post!! Thank you so much for visiting! I am happy to hear from friends who love animals and who support rescue! Nicely written, very helpful for those going through rescue. We've rescued 2 dogs and would take more if we had the space! We're gearing up to adopt a rescue dog/puppy in the next few months. Our kids are pushing for it big time and we're almost ready to go for it. Thanks for the tips---important stuff when you're bringing someone into your family (esp with kids and a cat already in the family!). A very sweet post to help others adopt a new family member of their own too! Thank you for responding to my question, Abby. I think that by sharing your story and your tips for successful rescues, you will help many other pets find their forever homes. And to me, that is the key. The adoption should be forever. Not that long ago I heard a co-worker talking about how her family was going to "try out" a pet for a week, then take the pet back if things weren't good, then "try" another until they found a match. Our family believes one should do all of the homework, soul searching, logistics etc BEFORE bringing the hopeful pet home. We adopted Billy at 2.5 years, then when we lost him we welcomed Oz at 7 years. We were told both would do best as "only" dogs. We adopted Zeus, our first ever kitty after he spent 16 months in a shelter situation, having been surrendered as vicious. Which he isn't, by the way. My point being that our family's commitment to these pets is forever, and we will accommodate them as much as necessary. Taking them back was simply not in our thoughts. I really like your suggestion that the existing dog meet the new dog on neutral ground. That really mskes sense. home and you have expressed that need very well Abby. Shelby, Chihuahua 4 1/2 lbs. This is adorable! Over on my blog (www.mrsbarbelle.com), on Friday's we do Fluffy Friday. Maybe I could feature Abby one week! Dear friends, thank you so much for visiting and commenting! I loved reading your words about rescue. Barbara, I agree with you that rescue is a commitment. I'm so glad you rescued your furbabies - and I know that they have brought a lot of joy to your family. I love reading about Oz and Zeus, and seeing photos of them! Thanks for the visit! I have enjoyed visiting your Fluffy Friday posts in the past and would love to be featured. Thanks! Awesome advice. It is best to first look at your local animal shelters. It can be devastating to know that they only keep the animals for so long. There are so many animals in need of a home. Thanks, Ashley! I agree completely about animal shelters ... those cats and dogs are in immediate, urgent need.